Doctors have warned that pressure on hospitals to admit as many patients as possible has added to the problems of fighting the hospital superbug, MRSA. The bacteria, which can cause infection and may be fatal, is a growing problem for the NHS. In England alone there are more than 7,000 cases a year. 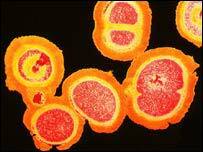 MRSA rates in the UK are nearly 50 times higher than in the Netherlands. The government is examining the lessons to be learned from the Dutch. I have been to the Erasmus hospital in Rotterdam to see how it keeps MRSA at bay. The Dutch hospital system takes a zero tolerance approach to MRSA. If the bug can't get in, it can't spread. The strategy to fight it when it does appear is called "search and destroy". That means identifying all possible sources, and taking aggressive steps to eradicate it. During our visit an MRSA case is confirmed on the cardiology ward. Everyone who may have come into contact with the bug is tested for the bacteria. Staff who've picked it up are sent home, and treated with antibiotics. And if that doesn't work, they may even have to have their tonsils taken out, before being allowed back. A nurse on the ward, Bas Van der Verhoeven, takes swab tests on his mouth and nose to be sent up to the labs. It's an uneasy time. He said: "I think it could be a worry because you can be dismissed from the hospital for quite a long time. "For one or two or three or four months doing nothing. You are not allowed to go to your job. "I think for a lot of people who like doing their job that's a big problem." The MRSA patient has been put in strict isolation. For a simple blood pressure check the nurse has covered up with a gown, mask and gloves. We certainly believe that by adopting the policies that they're using in the Netherlands that we will be able to start to make inroads into this problem. If the bug is passed on the ward is closed. Patients are moved out as soon as possible, the whole area is cleaned and disinfected, and if there are any doubts about the safety of equipment or boxes of medication, they're simply thrown out. Dr Margaret Vos, head of infection prevention, says the tough approach has paid off. "In this hospital we have 37,000 admissions a year. And we only have 50 persons MRSA positive a year. "And half of them have come from a hospital abroad. So within our hospital that's not many patients who have come MRSA positive." When you look around the wards here there are obvious differences with the usual NHS scene - more staff, less pressure on beds, and more single rooms where patients can be isolated. That makes it easier to absorb the disruption caused by these tough MRSA policies. But professor Henri Verbrugh, head of microbiology and infectious diseases, says for doctors, nurses and of course hospital managers with budgets to manage - closing wards is never popular. "They see their capacity go down. They see their colleagues being sent home. So of course this provides stress and tension within the department. "This can only be managed if there's a bigger good for which this is done and everybody recognises that it is for the better of the whole hospital if this procedure is done." And it is not just this hospital - the policy is the same right across the Netherlands. Professor Verbrugh says it is crucial to ensure MRSA isn't simply passed on from one hospital to the next. But when you look at the NHS, MRSA rates vary enormously from one hospital to another. The Chief Medical Officer for England, Professor Sir Liam Donaldson, has been here in Rotterdam looking at the Dutch system. He clearly believes there are important lessons to learn. "There's nothing magical in what they're doing, it's methodical work. But we're starting from a much worse position so we won't be able to move overnight to what they do. "But we certainly believe that by adopting the policies that they're using in the Netherlands that we will be able to start to make inroads into this problem. "We are very, very optimistic, and very committed to doing something about it."